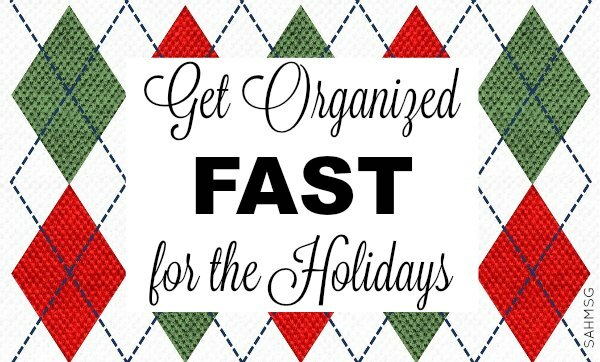 Get Organized FAST for the Holidays! We all know how much work it takes to get organized. It takes time, and it is that time that drags us down. 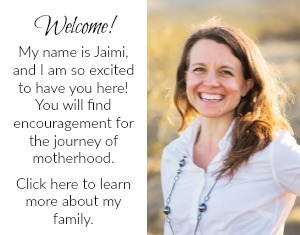 Living organized does not drag us down, though, it frees us to do more of what we want to do with our families. My motto is: Live clean to stay organized. The reality: things pile up! There are a few areas in my home that collect the piles of papers, dishes and toys until I can get to them. I often have to make a focused effort to get to those piles and clear them up. 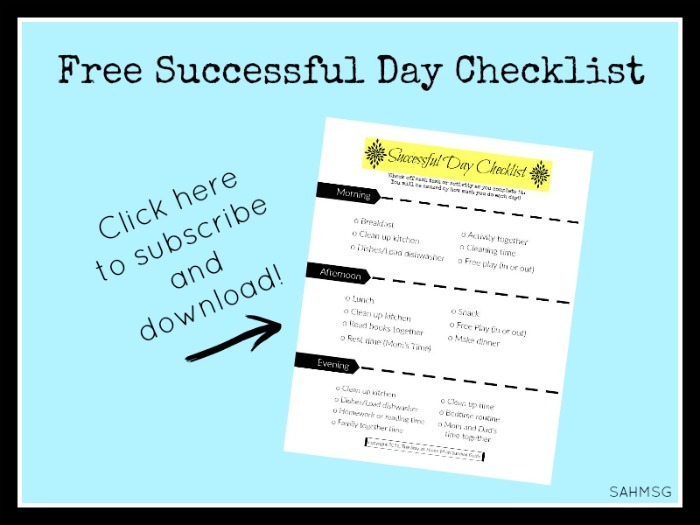 I decided I wanted to share how I get organized fast-despite life causing piles and clutter. I am hosting a holiday prep event with moms and kids at my home soon. 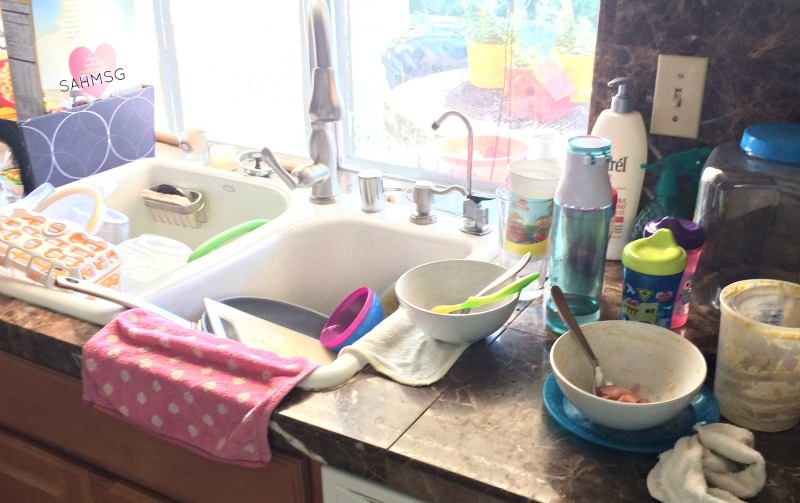 I am using these tips to get organized fast to keep the house as clean as possible. To feel like I am making progress with my plan to get organized, I focus on one room at a time. 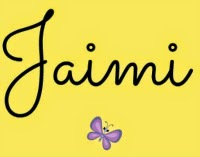 I just did this the other day to take pictures for you. This is a behind the scenes “reveal” of my messes. I start in the most-used rooms to get the biggest impact, and so I can see my progress. The kitchen is usually my target. In the kitchen, I always have cups piled up. My house is not the one with clear counters all the time. The cups, dishes that I did not get to because the twins needed me a bit longer at bedtime, the piles of papers from my son’s school and daily mail delivery pile up. I do not like the look of clutter, so eventually I have to clean it up to keep from feeling overwhelmed. While the kids were playing together (a quiet moment where I was not immediately needed) I started in on the kitchen mess. This was my attack plan! Hand wash large pots and pans. Go through paperwork to file or shred. Get the kids to help shred paper. I rolled my Fellowes shredder into the kitchen, plugged it in, and let my preschooler shred papers while I started washing the pots and pans. I could supervise and we could tackle two jobs at once. The heavy-duty Cross-Cut blades can handle up to 16 sheets of paper per pass in addition to staples, paper clips, credit cards, junk mail and CDs, so I do not have to worry about sorting the papers before the kids get to shredding. (Always supervise when your child is near the paper shredder!) I will show you how to use the shredded paper in a later tip! 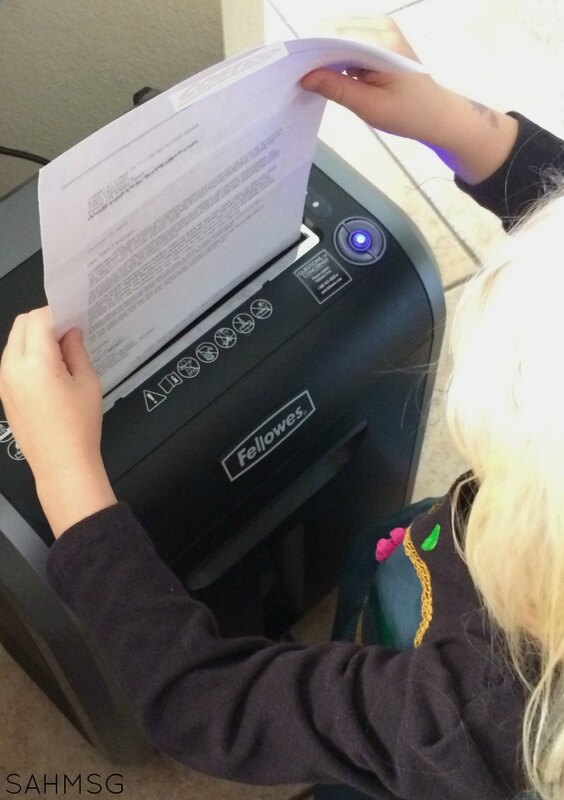 I like having the kids help shred for a couple of reasons, 1) They like to do it, and 2) I have a Fellowes shredder with SafeSense® Technology so shredding stops if hands touch too close. I can let them grab papers and just go! Staples and even small paper clips run through this thing. Plus, it lasts about 20 minutes, so if I am clearing out old files or my son’s school work, the kids can keep feeding papers into the shredder for a while. When the kitchen is done, I move to the family room/playroom. We have labeled bins for toy storage. I have always used this method since my first child was born. It helps my children learn where the toys go when I ask them to clean up. We do not have a separate playroom, so this method of toy organization helps keep the house from getting too consumed by toy clutter. I created a go-to manual for my household. School schedule, daily schedule, important events, budget info, emergency numbers-all info important to the daily functioning of our home are in one organized location. The holidays bring about a lot of extra events, so being able to have important info in one place is handy. I sometimes check my phone, see a few email notification about bills that will be due, or supplies I need to donate to my child’s class (that reminds me…), then I get distracted, do not write the dates on the calendar and the inbox backs up. Now every time I view my email, I do it near the calendar so I can immediately write down important dates. No forgetting and no time wasted finding that email again. 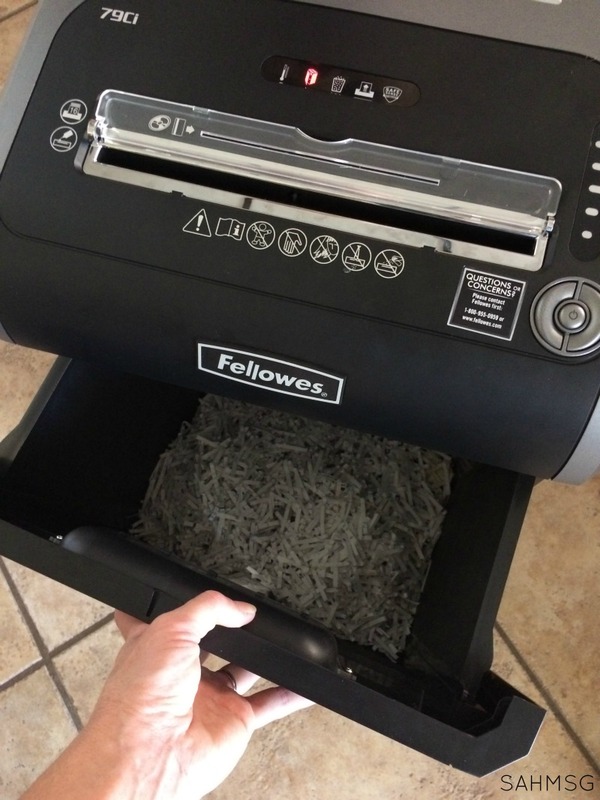 As I mentioned in Tip 1 above, my children usually help me shred papers with our Fellowes 79Ci power shredder. I love it, because it is so versatile. The kids ask if they can help, so I let them. My children have regular chores they do daily, and they help a lot with extra prep for events-they get excited to help! Match the socks in the laundry basket. Put their clothes away (preschool and older can do this). All of these tasks being delegated frees you up to get a meal plan ready for when Grandma and Grandpa visit, or fold that load of laundry that has been in the basket all day waiting for you! You may run out of things that the kids can help you do. They will make new messes if you do not keep them focused on an activity, and you may need some focused time to finish up. I use these when I am finishing up my prep for people coming over. Set up some simple learning activities at the table like busy bags or puzzles. Pop in a book recorded to CD and let the kids read together. Use the shredded paper created when you de-cluttered for a sensory activity. 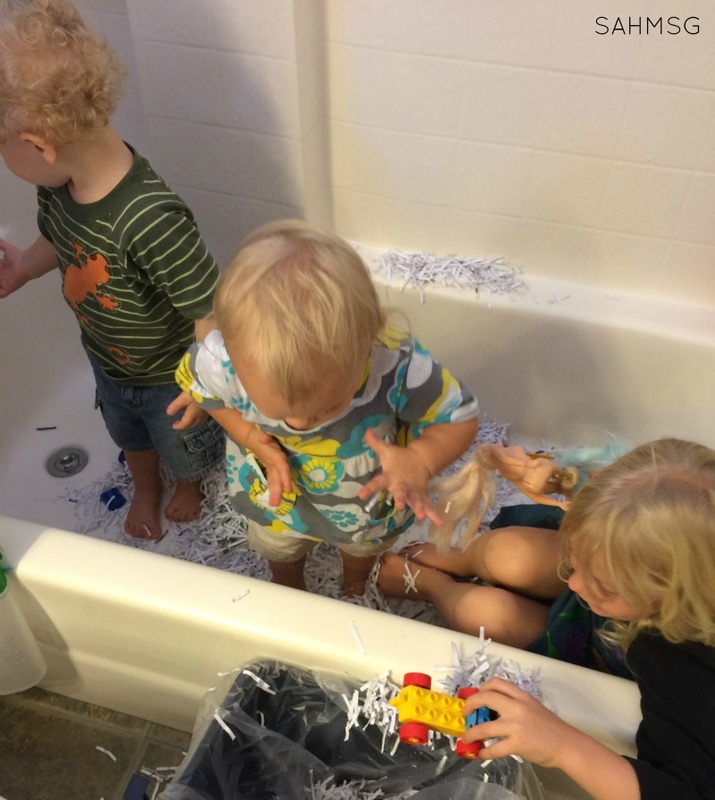 Put the shredded paper in a bathtub to create a sensory bin. (No water, just the paper.) 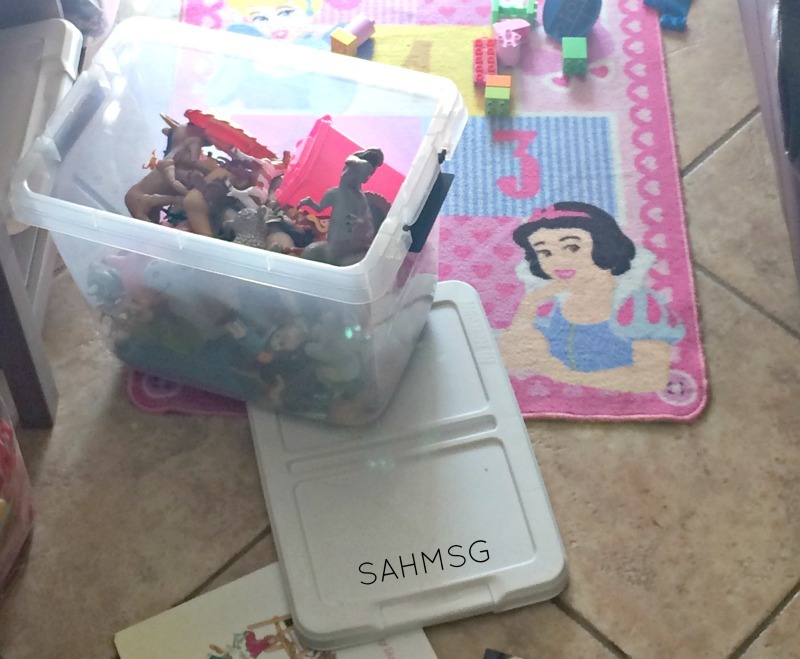 My shredder has a drawer for easy removal of the shredded paper, so it is easy to set up a sensory bin quickly. First I plug the drain. I add small toys, and pour in the shredded paper. The kids played long enough for me to get the laundry put away! My Fellowes 79Ci shredder can handle up to 16 pieces of paper with one pass, so I can create a fun shredded paper sensory bin quickly! It has a jam-proof and Energy Savings System that maximizes shredder energy efficiency 100% of the time – both in use and out of use, I know my shredder is running efficiently. SilentShred™ Technology that offers ultra-quiet shredder performance means I can shred even when the kids are taking a nap. That is prime time to get stuff done! The Fellowes 79Ci is available at Amazon.com and Office Superstores with a suggested retail price of $239.99. Shredded paper sensory bins are a go-to activity for rainy day indoor play too. The bulk of the paper shreds are easily picked up by hand and the rest vacuums up easily. When you need to get organized FAST this holiday season, remember these simple ways to get the house organized. You can get organized fast to stay as stress-free as possible and enjoy more time with your family.